Harbin is well known for its cold artic-like climate which provides more than enough snow and ice. Also labelled as the “Ice City”, Harbin is also famous for its ice and snow art plus its amazing ice sculptures and ice lanterns. This fascinating international ice and snow sculpture festival would draw tourists and even locals to witness for themselves the breathtaking arts produced from mere snow and solid ice. Nonetheless, other interesting activities on snow and ice are also unforgettable experiences which one can enjoy at Harbin. First held in 1963 and discontinued during the Cultural Evolution, China’s Harbin International Ice & Snow Sculpture Festival resumed in 1985. Known to be the largest ice festival in the world and located in north eastern China; Harbin also won the Guinness World Record for the largest snow sculpture created in 2007 during the festival. 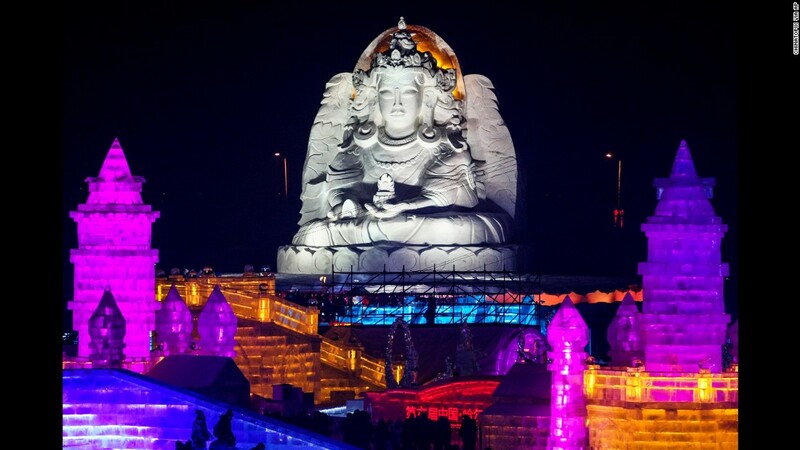 Harbin’s 3 theme parks consists of firstly, the Sun Island International Snow Sculpture Art Expo which is a day theme park for snow sculptures. Then there is the Harbin Ice and Snow World which features ice and snow sculptures, shows, lighted-up ice buildings plus several kinds of ice and snow activities which are lighted by computer-controlled LEDs. The Zhaolin Park Ice Lantern fair is filled with ice lanterns, slides, animals, buildings, gardens with flowers, waterfalls, European-styled churches, magical figures and even hosts the annual ice lantern garden party. During the festival, the theme parks are filled with giant ice sculptures in the form of monuments and famous buildings. These sculptures were said to be crafted by some 10,000 workers who collected snow and ice blocks from the Songhua River. Other than that, visitors could also discover stairways, tunnels and slides made from ice and participate in interesting activities such as hockey, skating, dog sledding and ice swimming while accompanied by mesmerising coloured lights that flood the entire place. Besides, other interesting activities held during the festival would be calligraphy display, international sport events, folk songs and dance performances, painting and photo exhibitions, international ice sculptures competitions, fishing, ice football, trade talks and fairs, ice and snow film art shows, wedding ceremonies ice-sailing, ice lantern shows and even snow carnivals.